Thomas Jackson served on the VMI faculty as Professor of Natural and Experimental Philosophy & Instructor of Artillery from August of 1851 until the beginning of the Civil War in April of 1861. The Virginia Military Institute is the oldest state-supported military college and one of six senior military colleges in the United States. Today, evidence of the legacy of General Jackson can be found all over the grounds in the form of statues and inscriptions. 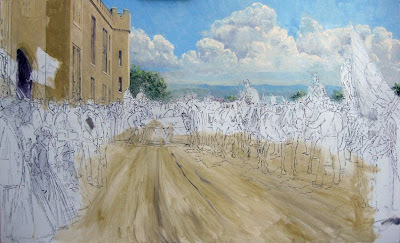 The viewer can now see the VMI Barracks to the left. To the right is the statue of George Washington.